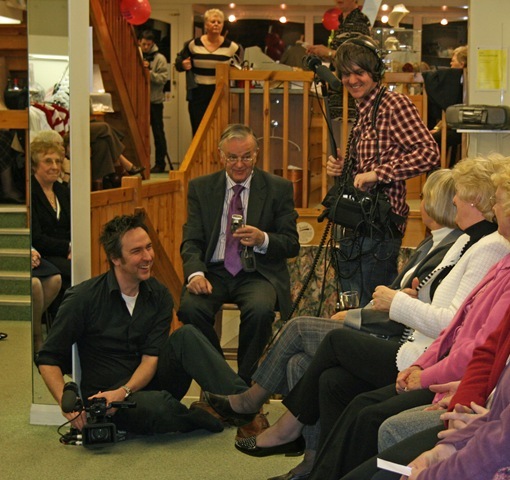 The producer of The Department Store, Richard Macer (sitting on the floor) enjoying a joke during filming with David Milner (beside him) and customers at a fashion show at Milners of Leyburn. THE dynamics of a family-run shop in Leyburn were turned into a humourous and very entertaining TV programme in late 2008 – and has been shown in various parts of the world since. There were film crews at Milners of Leyburn for six months until April that year and they caught every aspect of life there for The Department Store. He agreed that the film was very funny because it did portray him and his wife, and David and Linda Milner as they are. That period at the store was a watershed for the family. Although David has now retired he does support Leonie and Keith. But he has time now to be more active in the community, particularly through the Rotary Club of Wensleydale and Leyburn Methodist church. David Milner is proud of the fact that Leyburn in Wensleydale has one of those now rare British institutions – the independent family-run department store. Five generations have now kept it going since the business was started by David’s great grandfather, Christopher. Christopher’s father, George, settled in Wensleydale in the 1840s, where, as a master stonemason, he worked on the construction of the railway, supervising the Irish navvies and overseeing the building of the bridge and railway stations. It was probably a relief to reach the grand age of 21 and go back to his parents in Bainbridge. He started to go round all the villages with a handcart and a backpack, calling on people to show them clothing and fabrics and seeking orders. “Manufacturing wasn’t that big in those days and so he had people who made things for him like working trousers,” explained David. Then, 10 years later, in May 1882, Christopher settled his business in Bridge Street, Hawes, as a general drapers and milliners. He did, however, continue to visit his customers, as well as travelling regularly to Leeds or Manchester by train to buy supplies, thus setting a pattern which his descendants would follow for many years. His sons carried on the tradition in the 20th century with Percy in charge of the Hawes shop while Cyril opened Milners stores in Leyburn, Appleby and Bentham. Harry took on the shop in Kirkby Stephen. Between them they covered the dales from Barnard Castle to Skipton and Kirkby Lonsdale. Percy’s sons, Raymond and Carl, later joined him in Hawes, with the latter being in charge of the ironmongers. David’s father, Raymond, returned to the family business after being demobbed from the RAF after World War II. He shared his knowledge of electrical and mechanical engineering with David. So when David left school at 16 and was offered the choice of selling ladies’ clothing alongside his father and grandfather, or working with his uncle Carl he chose the ironmongery. In the late 1950s David went to Darlington to serve a five-year apprenticeship and then worked as a Hoover engineer. Just as he was contemplating emigrating to Canada his father offered him a partnership which he accepted. They decided to leave Uncle Carl in charge at Hawes and bought a business which had shops in Leyburn and Middleham. The original Milners’ shop in Leyburn had closed in 1945 and that premises is now owned by the Co-op. David learned his trade in the stores for about six months before his father introduced him to the suitcases – ten in total, each bound in leather, double-sided and very heavy as they contained clothes and household goods for all. It was David’s job to travel around the dales with those suitcases. He chuckled at the memories of the number of times he had opened them in lonely farmsteads and had all the children peering in asking: “What’s in here Mr Milner?” “If it was a big family sometimes the kids’ cases came out first and the parents would not bother about themselves,” he commented. Even so he carried a wide selection of clothing for women, including corsets, and the essentials for men like corduroy trousers and working clothes. In some villages it could take him several days to go door to door before finally returning to the shop with his order book full. He remembers: “In the sixties people didn’t go out as much as they do now so they were pleased to see you. It was a nice way to do business. When he delivered the goods a week later he would usually receive payment, unlike in earlier years when the store gave its customers six months credit. In time the shop attracted more customers and so David packed away his suitcases for good. He did not remain in the shop for long however. Leaving his father in charge, he toured the area measuring floors and fitting carpets. As more dales folk bought cars change was inevitable. “The locals are getting older and the young ones are moving away and they don’t deal in the same way at all. It’s a complete change from my early days,” David commented. In the 1990s, as the only descendant of the founding member who wished to continue with the Milners’ family business and with most of the other shops closed, he chose to extend the store in Leyburn and sell that in Middleham. Their wares have changed considerably since Christopher’s day. Gone are the flannels (in scarlet, white and grey), the corsets, the tweed dress material, the all-wool shirting and cloth hearth rugs. But Milners still have a reputation for fulfilling special orders whether for men’s long johns or providing a woman in Australia with the same patterned carpet as was used on the Titanic. David did consider selling the business a year or two ago but thankfully his daughter, Leonie, and her husband, Keith, decided to take it on. Now David can look forward to retirement in April and know that Milners is in the capable hands of the fifth generation. It has not been easy handing over to Leonie and Keith, however, and some of that trauma has been captured by the TV crews. As Milners is small compared with the other two department stores being filmed the crews didn’t miss anything in Leyburn. David Milner retired in 2009 and Leonie and Keith began transforming the department store so that by January 2010 it was very different to the one seen in the BBC documentary series. They brought in their very own “Mary Queen of Shops”, Sarah Harbour, who had worked in the fashion retail business for over 20 years. She helped the Garrard’s revamp Milners of Leyburn. One of their big successes in 2010 was buying in organic cotton clothes by Seasalt. “We have sold out twice since we started bringing in Seasalt – it’s gone fantastically well,” said Leonie. Sarah was involved with changing things around in the shop and bringing in new ideas. The lingerie and underwear have been moved to the basement from the lower ground floor to make room for an extended range of accessories. All the bed linen and towels are now on the first floor where the Garrards made new shelving to accommodate it. They have de-cluttered that floor to make the most of their best selling carpets and have built two mock beds so that bed linen can be better displayed. David and Linda do occasionally help out at the shop when they are not on holiday. “They have both stepped back from the business,” said Leonie. David has been doing a lot of gardening and painting. “He cleared out the loft in their house, rewired it all and made himself a little painting studio – that’s his little hidey hole,” she added. Early in 2010 David was also able to take part in a charity trip to the Gambia to deliver equipment to the only school for the blind in that country. They were grateful for the television coverage especially during a time of economic depression. “The Department Store has helped to put us back on the map,” said Leonie.